When an institution does not evolve with best practices that include parent support, it risks suppressing, isolating, and driving out the most socially vulnerable regardless of their high professional capability and artistic potential. Every leader must seriously consider if their institution has created systems that improve or inhibit the function of the individual. Our organization Parent Artist Advocacy for the Performing Arts is creating a National Handbook of Best Practices for institutions to support parent artists, collecting interviews with individuals alongside testimonies from institutions to illustrate how both cause and effect—structure and experience—must be explored in order to gain full perspective of harmful or healthy practice within the context of employment and caregiving. When an institution does not evolve with best practices that include parent support, it risks suppressing, isolating, and driving out the most socially vulnerable regardless of their high professional capability and artistic potential. Incorporate parent inclusion as part of your equity, diversity, and inclusion committees’ conversations and initiatives. Medical vulnerability, including certain aspects of parenthood, receives inconsistent support across theatre institutions. Many parent artists refrain from articulating their needs for fear of being labeled a liability. The inability of an institution to adjust and dignify the medical needs of artists and staff affects every individual who enters the institution because every individual has the potential to encounter sudden medical complications. Lack of support for medical realities puts the institution itself at a disadvantage because when these realities surface, the ability to sustain relies on advance preparation and transparent and supportive culture. Disproportionately, women of color experience higher medical neglect in childbirth and care in the year following childbirth. In the United States alone, discrimination in medical treatment, lack of access to health care, and lack of postpartum support in the first year of motherhood are some of the factors that contribute to increased fatality in mothers of color. Because mothers of color lack social and medical support, the need for professional structural support for mothers of color in major life events is even greater. In order to achieve diverse upward mobility and employment in our institutions, we must include parents in EDI work by intentionally supporting them as professionals. When I met with mother artists of color in a our first focused forum and gathered stories from around the country, race discrimination clearly increased the likelihood of motherhood bias. Stories included poor performance reviews of women of color who spoke up for their legal postpartum rights in the workplace; high flexibility of children in the space for white children but greater restrictions over children of color; mothers of color labeled “unprofessional” for bringing their children to work while the same office celebrated a white mother in her office with an infant, and decreased casting opportunities for artists of color in general, with even further reduced work opportunity for mother artists of color who could only afford to work at institutions with parent-support or understudies. I’ve written on the motherhood bias contributing to gender discrimination for all professionals, regardless of caregiver status. All women experience caregiver discrimination regardless of their caregiver choices, and lack of parent support perpetuates idolizing cisgender men with children by dividing them into a sociocultural category of constant professional with the expectation they will have a caregiver at home, often assumed to be a woman. A woman, then, pursuing a profession, is expected to fall into the caregiver role and out of the professional trajectory. This gender bias keeps parenting on the binary and, as a result, perpetuates the idea that a professional who is a man with children has a partner at home caring for said children, so he can work perpetually without interruption. Production schedules, promotional opportunities, networking and fundraising events are all often curated around this idea – the professional can be available around the clock because they have a caregiver available around the clock. A professional, then, who identifies as a gender besides a cisgender male but who also has children must find caregiving solutions that create the illusion of being able to work perpetually without interruption in order to stay “in the game” to fulfill the historically masculine expectation created from predominantly cisgender male cohort with a corporate approach to work ethic. These binary expectations also inhibit the efficacy of cisgender men who take on caregiving responsibilities in an attempt at partner equity because they will fall outside the traditional caregiver consideration. Contributing to the support of parents with a focused intention to decrease discrimination against parent artists of color increases the health, professional viability, and sustainability of all employees, particularly those of color. The theatre’s role as an employing institution can improve the support of mothers of color by recognizing need, engaging in solutions, and sustaining the individual so that they can in turn more fully manifest their professional potential and artistic capabilities. Initiatives such as all family leave and flexibility of children in the space with intentional equity create opportunities for caregivers to share responsibilities more equitably and increase race and gender diversity in terms of professional accessibility, sustainability, and promotion. Educate and prepare for the medical realities of parenthood as part of reasonable accommodations in the workplace. Often, this topic of reasonable accommodations in the workplace arises in the context of pregnancy and breastfeeding. While institutionally the standard and consistency for support of these realities is already low, the lack of policy and protection for basic parent accommodations makes accommodation for unexpected events and tragic realities virtually nonexistent. Parenting includes a dynamic range of events that affect the individual’s medical, physical, and emotional realities. Events to consider include miscarriage, ectopic pregnancy, loss of an infant, infertility, fertility treatments (When infertility affects all genders and over 44 percent of women with infertility seek treatments, why is this conversation so uncommon in our workplace accommodations? ), late diagnosed/unexpected special needs, and early diagnosed/expected special needs. For any of these events, considerations should include time away for medical aid, assessment with the doctor on returning to work, and being trusted to do the job while also being given space to live in the body differently. For parents of children with special needs, diagnoses may be anticipated before birth or adoption and preparation requires individual adjustment to hours, approach, or rhythm—according to the parent’s work needs in collaboration with job fulfillment. Some parents do not discover their children’s disabilities except over time. Having a supportive environment assists these life events as responsibilities and processes for incorporating life and work change. Numerous parents we’ve spoken to have preferred staying anonymous because they’re afraid that their children’s needs will be seen as a liability, a burden, or an overwhelming identifier over their professional contribution. What sort of theatre are we making where this is the fear we instill in its contributors? Support can come in the form of preparing for these realities through education and awareness that generates open, safe space for dialogue. In a featured interview in our handbook, actor Adina Verson shares her experience with miscarriage during a production. Her experience was extremely supportive because of a cast and artistic staff committed to transparency, support, and flexibility. Her collaborators showed support by acknowledging the natural process of grief as it arose and letting her lead the experience, allowing it to pass when it had passed—or not. She writes, “If [the miscarriage] was so serious that I felt like I couldn't be in the room, then I would [have] quit. But if I'm there to serve the room, then we all have the same goal. I'm still me, and it's still enriching the play.” She also emphasized that someone else in her position may have had different needs. PAAL steering committee member and frequent panelist Adriana Gaviria—who wrote the powerful piece for HowlRound on work-life balance and being silenced—recently co-presented with me on Motherhood & Leadership at the Statera Conference 2018. Adriana mentioned that each time she participates in a panel on parenting, she has a moment of wondering, “Do I belong here?” Not yet a mother but interested in and an advocate for motherhood, Adriana always speaks powerfully and profoundly on fertility rights and benefits, medical education for options, and work-life balance. 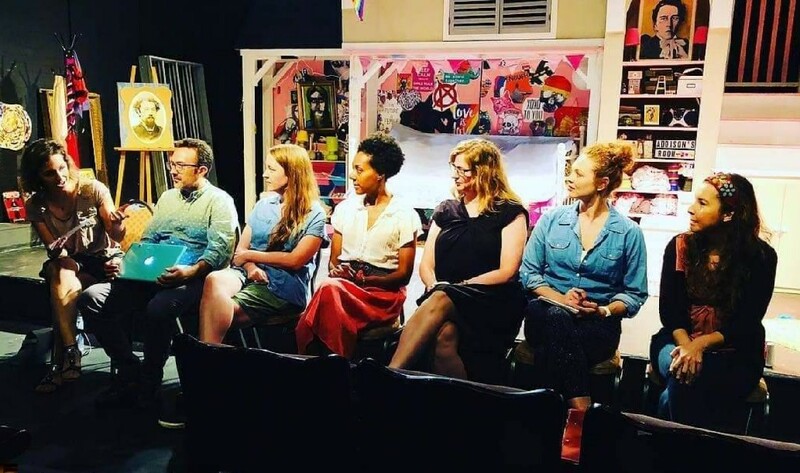 When she mentioned these rights at our New York City Forum, someone commented on the livestream that they “never thought they’d hear anyone talk about IVF treatment during a show” and were thrilled that the conversation was happening. Our forums include a simple option for all parents to mention allergies or special needs for our family-friendly events. We’ve hear that this offering “made it possible” for the parent to attend where they networked with other parents, contributed to dialogue, and engaged others with new work they had in process. These professional opportunities on a wider scale could have significant impact on who participates in our storytelling. Access, once again, is tied to education and accommodation. For some parents, caring for children with special needs means temporary time away until the child’s health or development achieves certain milestones. Resources for returning to work and structures built on understanding and inclusion for these needs would decrease the permanent resignation from theatre after and panic some parents feel before taking time away because resources and empathetic restructuring would increase the options for pathways back in. The key to successful function, as mentioned earlier, is creating a space and structure where the artist as a professional feels supported in transparency—maintaining, adjusting, coming or going—with dignity and primary agency. Initiatives such as flexible medical leave options for specific life events can help an institution adjust to the individual needs of parents in elevated circumstances. 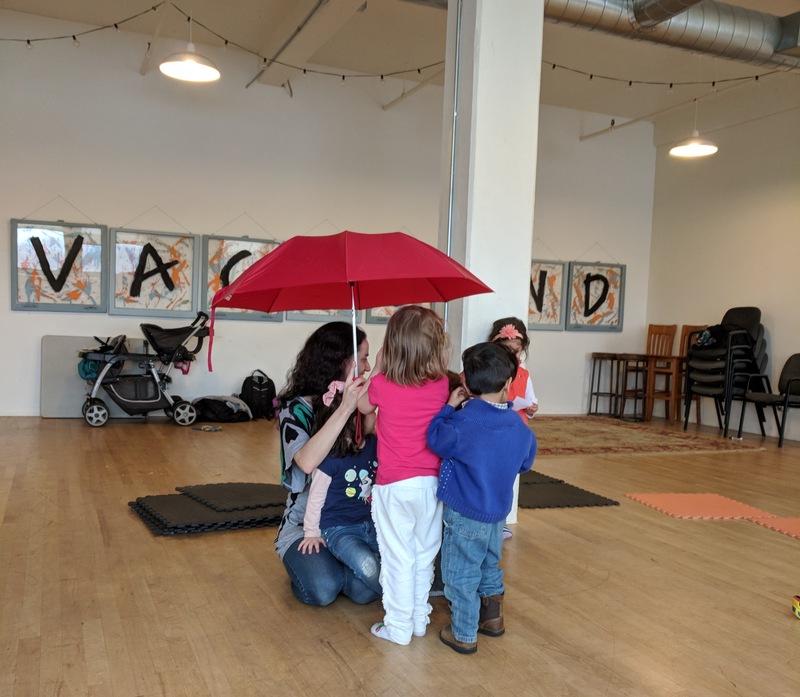 Some of the kids present at the mothers of color forum gather under an umbrella to play while mothers of color in theatre gather to share their stories at the PAAL mothers of color forum at Vagabond School of the Arts, Chicago, IL. Intentionally expand accommodation and support to include adoptive parents and foster caregivers. While pregnancy becomes a visual opportunity for discrimination in the workplace and postpartum bodies continue to be shamed, foster care or adoptive parents’ invisible preparation and efforts are at risk of structural neglect. We have also received stories about double standards in treatment from parents who have adopted, instances where institutions made adjustments for birth parents but did not consider adoptive parents’ needs as valid reasons for adjustment. Many individuals experience discriminating language as well. Once an adoption process is completed, the “adoptive” modifier should be dropped from the term “adoptive parent” unless clarifying specific adoption benefits. In conversation and indirect reference, the “adoptive parent” is legally, financially, logistically the parent—no modifier needed—and should be referred to and supported as such. While anyone who experiences a life shift has the right to pursue other career options, the stories that should concern us are the parents who are unable to continue their careers or experience tremendous strain due to lack of institutional education, awareness, and support. Most of the adoptive parents interested in speaking about the process were committed to the theatre and continuing their professional paths but also had clear insight into the crucial need for structural overhaul in how institutions provide for adoptive parents. Again, the intentional inclusion is necessary: does your institution celebrate biological mothers and births but deny support for adoptive mothers? In a featured interview in the handbook, Amanda Frangoulis noted that, “When an employee wants to adopt, the employer should acknowledge and treat the family and the child like they would a biological child and their family.” The nuance of potential for double standards in treatment also provide the opportunity for conversations on equity within an institution’s structure. [I]ntentional inclusion is necessary: does your institution celebrate biological mothers and births but deny support for adoptive mothers? Solutions like schedule adjustment, flexible work, job share, and increasing telecommunication provisions can increase opportunity for higher productivity when the time frames are more concentrated. When our structures seek to support the most vulnerable, the application of equity and inclusion deepens, and affects the entire company. The interconnected nature of accessibility between individuals and institutions highlights a core of our philosophy, which believes that as a whole, parent artists are doing the work and making adjustments; the work they are doing will have higher productivity when met with structures better made to receive their contributions. Our handbook aims to serve as a bridge between the two, founded on the insight that the better an institution prepares to help parents, the better supported the institution itself will be when accommodations are needed, because expectations and boundarie will be built with an awareness of need. Institutions should be advised that no parent is ever obligated to share any personal information of their family, family-planning, or needs, so to help connect with your staff and freelance artists, we recommend work-culture conversations that create openness and transparency, beginning with PAAL Steering Committee Member Devon Berkshire’s piece on HowlRound: Creating a Family-Friendly Work Environment. The more understanding there is between institutions and parent employees, the clearer our theatres will manifest exemplary work structures that consider humanity and tell stories that better engage with the vulnerability, dynamic, and reality of caring for humanity.